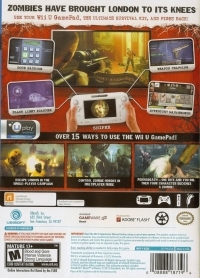 Use you Wii U GamePad, the ultimate survival kit, and fight back! Over 15 ways to use the Wii U GamePad! - Permadeath-one bite and you die, then your character becomes a zombie! 08-12-2015 lhanley Box Text ZOMBIES HAVE BROUGHT LONDON TO ITS KNEES Use you Wii U GamePad, the ultimate survival kit, and fight back! Over 15 ways to use the Wii U GamePad! 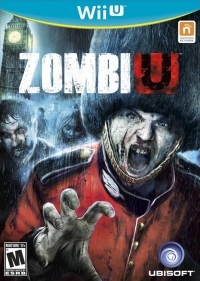 - Escape London in the single-player campaign - Control zombie hordes in multiplayer mode - Permadeath-one bite and you die, then your character becomes a zombie! 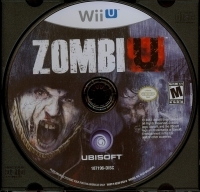 12-26-2012 st01c Box Text ZOMBIES HAVE BROUGHT LONDON TO ITS KNEES Use you Wii U GamePad, the ultimate survival kit, and fight back! Over 15 ways to use the Wii U GamePad! - Escape London in the single-player campaign - Control zombie hordes in multiplayer mode - Permadeath-one bite and you die, then your character becomes a zombie! This is a list of VGCollect users who have ZombiU in their Collection. This is a list of VGCollect users who have ZombiU in their Sell List. This is a list of VGCollect users who have ZombiU in their Wish List.